Planning to study abroad? You are invited to CollegeWeekLive's International Students Day. 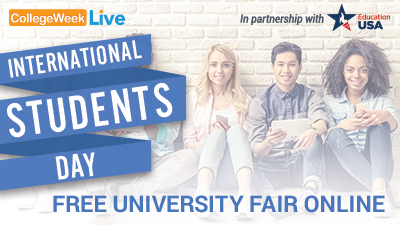 Presented by EducationUSA, -- a U.S. Department of State-supported network of hundreds of advising centers in 170 countries -- this free virtual college fair is your chance to connect directly with top universities across the U.S. and all around the world. Join us today! Sign up now to reserve your space!